What is more aggravating than an itch you can't scratch? Involuntary eye twitching, or myokymia, is a feeling that many of us will suffer from time to time. Sometimes the triggers are obvious; fatigue and seasonal allergies are both known to cause eye twitches, while other times the cause can seem a total mystery. There are a number of natural remedies that may help calm the muscles and stop these highly annoying, involuntary spasms. Just because it's not a dangerous condition doesn't mean you should have to grin and bear it. In very rare instances, eyelid twitching can be an indication of a serious underlying condition. These include multiple sclerosis or a lesion on the brain stem. These conditions typically begin with a host of other symptoms, making diagnosis easier. Magnesium deficiency is extremely common and can lead to a number of health complications. Adults require between 310 and 400 milligrams of Magnesium each day. This can normally be easily provided by a well balanced diet although the amount needed does vary depending on age, health conditions and medications. 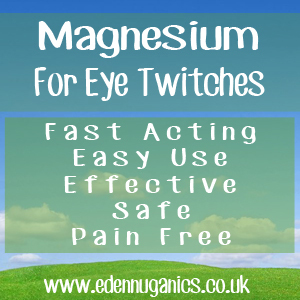 Other natural treatments for eye twitches? Potassium is a powerful nutrient found in many fruits and vegetables including bananas. Potassium is effective for the treatment of muscle spasms and other similar disorders. It is considered an electrolyte, responsible for a large number of enzymatic reactions within our cells, tissues and organs. Eating bananas regularly or taking a potassium supplement can help prevent and treat spasms of the eyes and other muscles. Calcium is an essential daily nutrient that plays an important role in the body. Renowned for its ability to strengthen bones and teeth. Calcium also plays a role in the maintenance of the nerves and nervous system. Without Magnesium our bodies struggle to absorb calcium from the food we eat. This nutrient also helps to maintain the neurotransmitters that communicate signals from the brain to the body. One of the most common household remedies for this ailment is the use of alternating hot and cold compresses that can soothe the over-active nerve that's causing the spasm. This should be repeated 4 times a day until the muscles have relaxed. Eye Twitch: What Causes It and How to Make It Stop!